Of all the animals that lived on earth prior to 350 million years ago, the most fearsome was probably the huge, armored fish from the Devonian Period called Dunkleosteus. Much larger than a modern adult great white shark, the Dunkleosteus was a powerful predator that lived primarily in shallow coastal waters. The Devonian Period, roughly 420 to 358 million years ago, was a critical time in the history of life on earth. Many important developments took place during this period which is often referred to as the “Age of Fish.” Vertebrate animals had yet to colonize land, but plants had started to take over and quickly created enormous forests. Early insect fossils are found from this age, but the vast majority of Devonian-age fossils come from marine environments. Water levels on the planet were high and shallow seas covered much of the land mass we know today. One huge and deep ocean (the Panthalassa) circled the entire globe. The water was everywhere and it certainly was where most of the action was: while trilobites had been thriving for over a hundred million years and were still common during the Devonian, the rise of many, varied types of fish started, some of which still swim in our oceans today. Sharks and rays began to evolve from earlier fish forms and plenty of other well-known marine animals flourished. Ammonites, brachiopods, and crinoids became widespread, and among the many lobe-finned fish, some evolved into what would eventually become the first true tetrapods–the ancestors of all amphibians, reptiles, mammals, and birds. While many of these animals would prove highly successful over the length of geologic time, during the Devonian there was one fish group that had the most success: the placoderms. Placoderm means “plate-skinned,”and the many types of fish in the group all were known to have a head and thorax covered in bony armor. One of the largest of the group was the superpredator Dunkleosteus. Named after the paleontologist David Dunkle from the Cleveland Museum of Natural History, Dunkleosteus was a huge, bus-sized predator with jaws that didn’t hold teeth–but crunched other animals with as much power as any animal to ever live. A 2006 study estimated that the bony jaws of a large Dunkleosteus could easily generate up to 11,000 PSI (pounds per square inch) of bite force. In comparison, a huge great white shark today (20 feet long) could generate about 5,000 PSI. Such results give it the most powerful bite of any fish in history, and only matched by a few animals, one of which was the Tyrannosaurus rex. The bony jaws of Dunkleosteus acted as shears and were constantly sharpening themselves whenever they crunched together. In many fossils of Dunkleosteus it is easy to see the smooth, sharpened surface of the jaws. 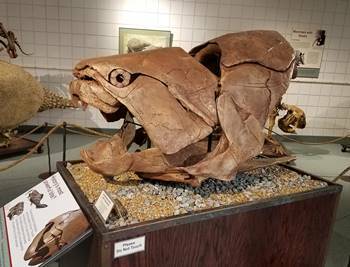 It doesn’t take much imagination to envision a Dunkleosteus easily splitting a large fish in half with one huge bite, and that’s exactly what paleontologists believe it did. It had no natural predators–its only fear would have been a larger Dunkleosteus. Painting of an adult Dunkleosteus; adult human for comparison. While the head and thorax of the animal is well known from a number of fossils primarily found in the Cleveland Shale formation in Ohio, our understanding of the remaining two-thirds of the creature is purely speculative. 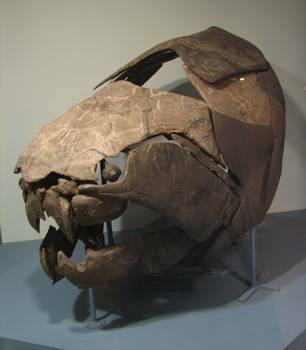 Reconstructions have been made using smaller, related fish that have been fully preserved, with the assumption that Dunkleosteus would have looked somewhat similar. Dunkleosteus holds the distinction of being one of the most well-known of all the huge predators that lived on earth before the dinosaurs. This makes it a popular exhibit in natural history museums, and indeed many today display a cast of one of the more well-known specimens from either the Cleveland Museum of Natural History or the American Museum of Natural History. Several species of Dunkleosteus have been discovered in other parts of the world, include Europe and North Africa, so it can be assumed that Dunkleosteus was very successful and widespread across the globe.